It’s not just tennis that brings the crowds to Wimbledon – after the last jug of Pimm’s, strawberry punnet and 142 mile an hour ace has been served – August welcomes spectators in their droves for Prudential Ride London; a 100-mile cycle ride that pedals along Wimbledon high street at mile 90. Parking facilities are an important part of infrastructure on any given day, but especially crucial for events of this scale but prior to the 2018 event, a surveyor noticed that a car park ear marked for spectator parking had an unstable wall, putting the facilities out of action until resolved. 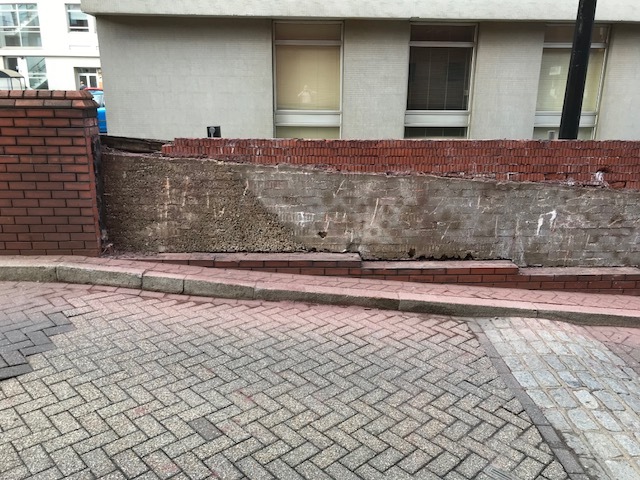 D Hammond was called to advise having repaired an adjacent wall with similar issues which had collapsed after torrential rain some time previously. Owing to the short window of opportunity to complete the works it was impossible to demolish and reconstruct the wall in the available time, however a plan was implemented to design and install a temporary structure to support the wall without affecting traffic flow through the area to allow for the car park to be accessed safely during the event. The car park was once again declared safe to use, just in time to provide essential parking for Prudential Ride London spectators, making their lives a little bit easier and making our client happy. Following the event, at a suitable time for the client the unstable wall was then demolished and reconstructed in a safe and timely manner.